The C64 Mini is a new all-in-one retro system that the company Retro Games Limited plans to release in 2018 to the market. Retro consoles and systems seem to be in high demand in this time and age. Nintendo's two retro consoles, the NES Mini and the SNES Mini, are in high demand and sold out nearly anywhere. But Nintendo is not the only company that is releasing retro consoles. A new Atari console will come out later (Mike will publish an article about that soon as it runs Linux), and now there is the C64 Mini which was announced just recently. 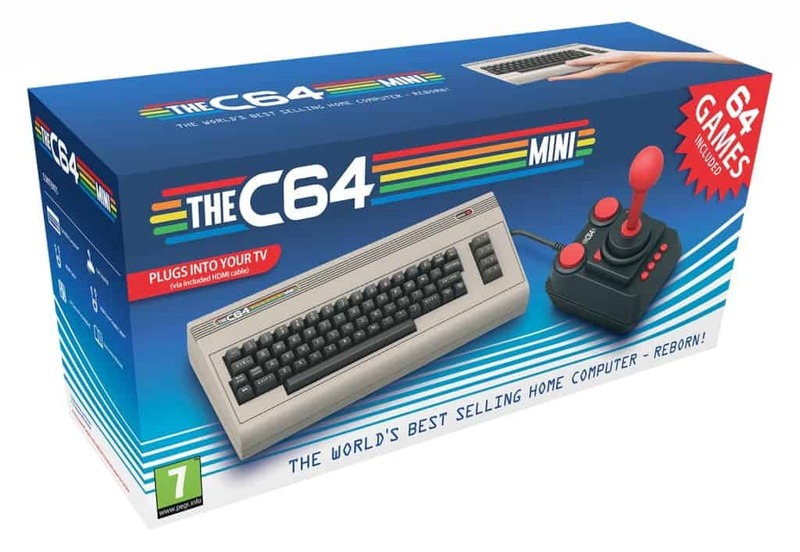 The package includes a replica of the original Commodore C64 (50% of the original size), a HDMI output to connect the device to modern televisions and screens, a classic style joystick that looks a bit like the Competition Pro joysticks of old, and 64 build-in games. The C64 is emulated by the system, comes with a save game function, and two USB ports that you can plug a keyboard in, or add a second joystick for two player gaming. Speedball II: Brutal Deluxe, Spindizzy, Star Paws, Steel, Stormlord, Street Sports Baseball, Summer Games II, Super Cycle, Temple of Apshai Trilogy, The Arc Of Yesod, Thing Bounces Back, Thing on a Spring, Trailblazer, Uchi Mata, Uridium, Who Dares Wins II, Winter Games, World Games, Zynaps. The package includes some all-time favorites such as Speedball II, Uridium, Winter Games, Paradroid, Impossible Mission, and Hawkeye. The company plans to release the C64 Mini with the help of distribution partner Koch Media in early 2018 for €79.99, $69.99, £69.99. Retro Games announced that it plans to release a full sized version as well in 2018. While it failed to mention explicitly what that means, it likely means that you get the same package but with a C64 system that has the original size instead of the 50% of the C64 Mini. The game package focuses mostly on action, but also on multi-player fun as games like California Games are also included in the listing. While the selection is quite good, it lacks some of the highest rated games of all time for the Commodore C64. Want some examples? The C64 Mini is a welcome addition to the retro revival that we see right now. The system will appeal mostly to gamers that grew up with the C64, and some that would like to get the opportunity to play games released for the system. While you can buy original C64 systems on eBay and other marketplaces for the same price, these don't come with HDMI and won't be as easy to use as you need to type commands to run games for instance. Then again, you get the full package which means that you are not limited to the 64 games that come with the C64 Mini. Now You: Are you interested in the C64 Mini? He he, good old times! I’m still keeping an good old c64! I can’t believe I threw away my Atari 800. The only game I use to play was the Commodore 64 game which gave you the possibility to add levels after the regular 150. A game that I played with much fun was Loderunner. The rest I could not care less. Even the on that time ferry sophisticated game flight simulator had to much imperfectness to be any interesting.